Last month, DOT revealed its plan to make Conduit Boulevard less of a barrier between neighborhoods near the southeast Brooklyn-Queens border [PDF]. With better, more frequent pedestrian crossings, the project should make it easier for residents to get from one side of Conduit to the other, but the design doesn’t include any bike infrastructure and leaves much of the high-speed geometry of the street intact. With few pedestrian crossings, wide travel lanes, and separate east- and westbound roadways divided by a large median, Conduit Boulevard functions a lot like a highway. Until recently, the speed limit was 40 mph — much higher than the 25 mph citywide default — and drivers still exceed it routinely. 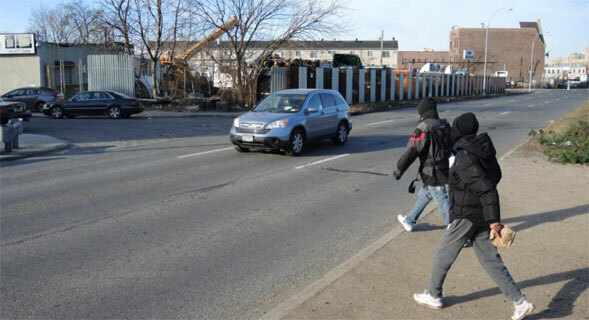 Since 2008, four pedestrians have been killed in the project area. Residents of East New York, Cypress Hills, and Ozone Park must contend with those conditions to access transit, parks, and schools in their neighborhoods. Beaten paths on the median attest to the substantial foot traffic despite the lack of crosswalks and high traffic speeds. The DOT project consists of basic safety improvements — adding signalized crossings and sidewalk connections, restricting left turns, and narrowing the most highway-like sections of the roadway. DOT also lowered the speed limit on the corridor to 30 mph in June, bringing it more in line with the citywide 25 mph default limit. The new signalized crossings are slated for the intersections with Pine Street and Grant Avenue, and left turn lanes at Glenmore Avenue and Pitkin Avenue will be repurposed for crosswalks where there currently are none. Along the entire corridor, crosswalks will be re-painted with striped, high-visibility markings. At the turn from Atlantic Avenue onto South Conduit Boulevard, which is basically a highway on-ramp, DOT will eliminate a travel lane and, further down the road, install a sidewalk leading to City Line Park. 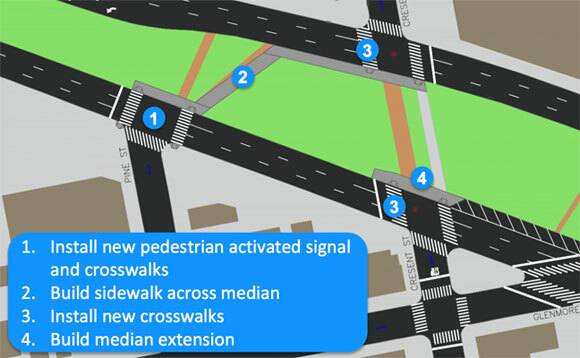 There is not currently a timeline for implementation of these pedestrian safety fixes. Conduit Boulevard is flagged as a “future potential bike path” on the city bike map, and a number of commenters on the project’s online feedback portal highlighted the opportunity to turn the wide median into a greenway. Advocates with Southern Queens Greenway Initiative have mapped how Conduit Boulevard could connect people on bikes to Jamaica Bay and points east. No bike infrastructure is included in this project, however. Other problems will persist, too, like wide traffic lanes and long pedestrian crossings where Conduit cuts across the street grid at a sharp angle. Because the starting point on Conduit was so dangerous, this round of improvements will probably make a noticeable difference, but a lot more remains to be done. Flat terrain and low car ownership rates = no protected bike lanes? wtf? I hope to see a real Greenway here eventually because it could be constructed by only removing some overgrown grass rather than any space for cars (even though the road is really overbuilt). In the shorter term, is there any chance for the 2010 improvements to part of Rockaway Blvd to be extended? http://www.nyc.gov/html/dot/downloads/pdf/20100603_rockawayblvd_slides.pdf It’s perhaps a more useful bike route than Conduit already since it runs much farther before reaching the Belt Parkway. I’d love to see the traffic calming improvements extended northwest past the Casino. Even if car ownership rate is low in the immediate communities, many people drive THROUGH. So the questions become how many already do so (to perhaps justify taking away a travel lane), and where could some take alternative routes. 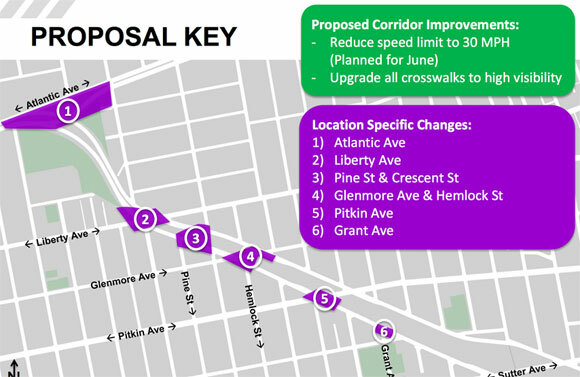 Ocean Parkway’s configuration would be a step backwards for Conduit. Conduit already comes with massive space already put together. So beyond a walking and biking trail and north-south connectors, there’s further potential for other things, like playgrounds or wetlands. Making it like Ocean Parkway would reduce that space into narrow strips in between moving traffic and add road space; it would take away this potential. The pace that DOT is moving to make Conduit safer for all users is disappointing, but on the plus side, they didn’t just arbitrarily slap mediocre infrastructure onto the median. This leaves the possibility for well-designed space for communities that doesn’t have to be ONLY a walking/biking trail (and north/south connectors), but can also incorporate maybe playgrounds, plazas, and wetlands. In other words, it can be another linear park. This is one of the long-term goals for the Southern Queens Greenway initiative. Raised median bike lanes are slated for a stretch of Atlantic Avenue crossing the Brooklyn-Queens border.